This week was my birthday. I sat eating the yummy breakfast that Ryan had made me and stared at the table full of gifts set out before me. I felt overwhelmed by the amount of presents… a little embarrassed in fact. Undeserving. But there I sat surrounded by gifts – some from Ryan, others from friends, and still more from family. And as I opened them one at a time, I was reminded that gifts are not just about the recipient, but also the giver. What joy spread across Ryan’s face as he watched me open the little surprises from him! And seeing his joy in the giving made my joy of receiving that much greater. So who am I to say I’m undeserving? Who am I to say it’s “too much”? Gifts are meant to be given and received. How different giving and receiving is to exchanging or trading or buying or selling or loaning! Just a few days ago we got to witness some more extravagant giving. On Sunday we celebrated the hand-over of the YWAM Medical Ship from Marine Reach New Zealand into the care of YWAM Australia. Can you imagine receiving a multi-million dollar ship with no strings attached? Can you imagine giving a multi-million dollar ship knowing that once it’s done, it’s done and you’ll never get it back?! It was humbling and inspiring and exciting and wonderful to stand as a witness to this amazing giving and receiving. Even though this gift has been in process for a couple of years now, to see the “keys being handed over” so to speak was a great moment in our YWAM history. It was the gift of a place that has been home to hundreds of YWAMers over the years… and will be home to hundreds more. It was the gift of a vision to see thousands of people in developing nations reached with medical care, practical services, and the Good News of Jesus… and a tool to help make that vision a reality. It was the gift of possibility and potential… and the beginning of a new season of ministry for us. The gift of the YWAM Medical Ship to us was an act of extravagant generosity and sacrificial giving that stands in complete contradiction to the stingy, possessive, selfish, competitive, and materialistic ways of the world. It is a gift that will keep on giving as we begin to steer and sail it into new unchartered waters where people wait for help and hope. So, happy 33rd birthday to me! 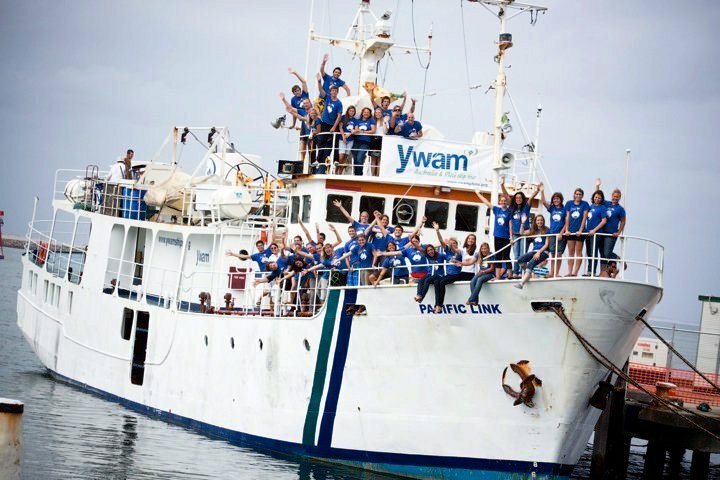 And happy birthday to YWAM Australia’s Medical Ship ministry! May we know what it is to generously give and receive all that God has for us in the days and years to come… And may we grow to be extravagant givers as we share the incredible gifts we’ve been given. Previous postFour healthy mamas. Four healthy babies. And many not so lucky. Next postFundraising for our trip – Can you help?? One of your best posts yet Adriel – LOVE it!!! So very, very good.